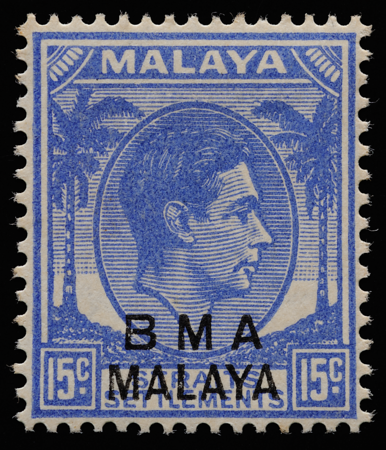 There were at least nine printings of the bma malaya 15 cents in different shades of ultramarine and blue on three types of paper (Cameron 1950). These spawned a large number of varieties, with major catalogues like Stanley Gibbons and Murray Payne disagreeing with one another. 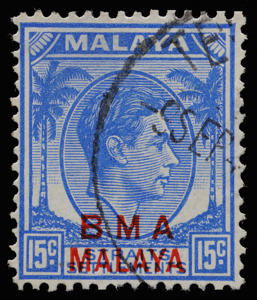 Dr Abdul Majid Dato Kassim distinguished no fewer than 32 combinations of shades and papers, qualifying the colours with the descriptors “pale", “light", “bright", “deep", “dull" and even combinations sometimes. Some of the “shades", though, may be environmental changelings, based on my examination of his scanned album pages. The eye’s perception of colour may also be affected by the paper (White 1979). 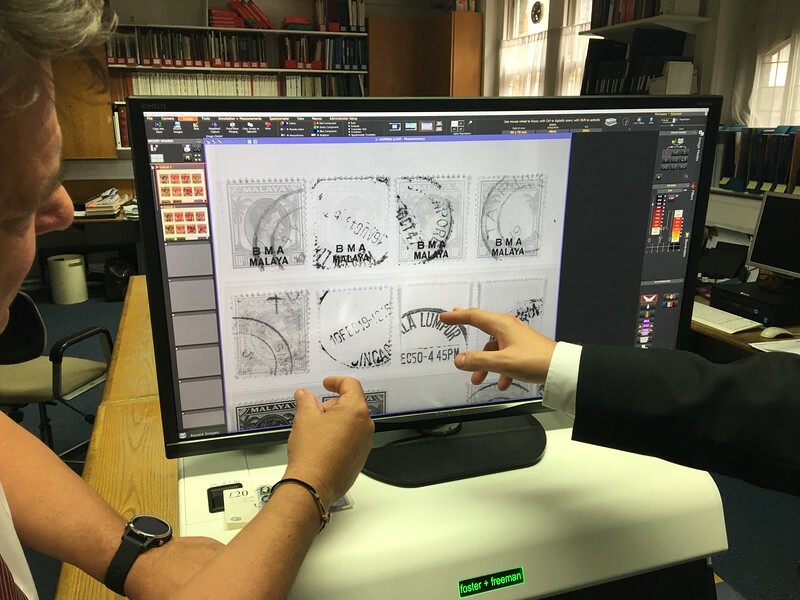 Examining BMA shades with microspectrophotometry and hyperspectral imaging between 400 nm and 1000 nm. An ink's variability offers fascinating real-world insights although it complicates the identification of catalogued mint shades. Even a single printing run can use different batches of ink, and even a single batch of ink can fluctuate with temperature, mixing, and printing pressure (Fernbank 2013). Rather than trying to classify into discrete shades what is essentially a continuous variable, deeper understanding may be gained by probing the chemistry and physics that give rise to it. Subtle shade differences were sometimes caused by accumulation of ink on the rollers that inked the plates. In an 1898 letter (Easton 1958), De La Rue explained: We beg to say that in printing it is impossible to avoid a certain number of sheets being either of too light or too dark a shade. The light sheets are printed immediately after washing up, and the dark sheets occur when the process of printing goes on for too long a period without washing up the rollers. 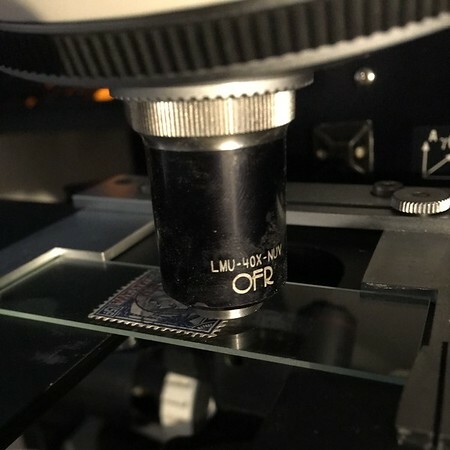 To go beyond traditional visual examination, selected shades (see Lin & Magis 2018) were spot-illuminated with a 325 nm helium-cadmium ultraviolet laser (Kimmon IK Series) through a Thorlabs UV (325–500 nm) 40× microscope objective, with a resultant power of 5.16 μW. The fluorescence spectra (download raw data) differ, as expected. But remarkably, they all have peaks or shoulders at the same wavelengths: 500, 520, 690, 900 and 970 nm. It's the peak ratios that differ from stamp to stamp. This suggests that the inks comprise varying compositions of a similar set of pigments, rather than different concentrations of single pigment or a different pigment for each stamp. 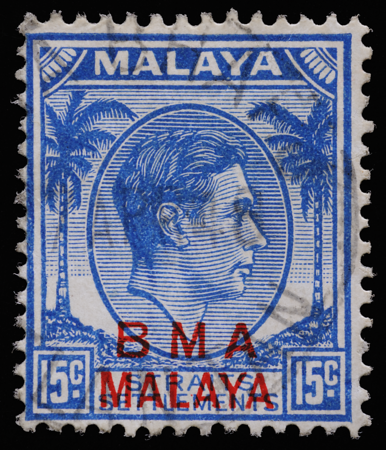 The pre-war ultramarine on the 'rough-surfaced paper of 1941' (Cameron 1950), locally overprinted post-war in black (Cameron 1950, Barker 1993) and issued in November 1945. 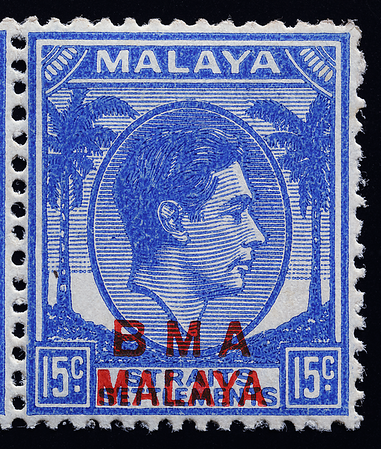 The horizontal edges of the stamp are perforated with 14 holes instead of the 13 found in the rest of the stamps below, as this particular batch had been printed by Harrison & Sons after De La Rue's print works had been bombed out of action in 1940 (Peter Cockburn comm. 2017). 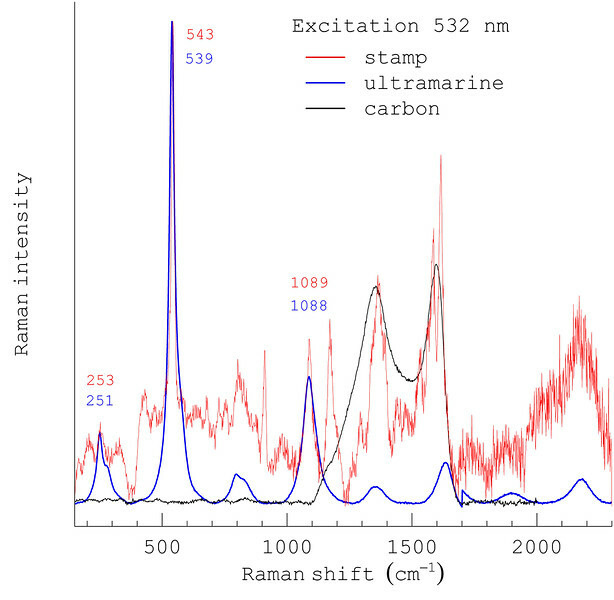 Raman spectroscopy of the ink on another 15 cents of the same pre-war vintage, showing a good match with the three largest peaks in a reference spectrum of ultramarine from Caggiani et al. (2016). To aid comparison, the empirical spectrum (download data) was baseline-corrected with a third-degree polynomial using the ModPoly algorithm (Lieber & Mahadevan-Jansen 2003) in the R language for statistical computing, and each spectrum was normalized to Raman intensity within (0,1). 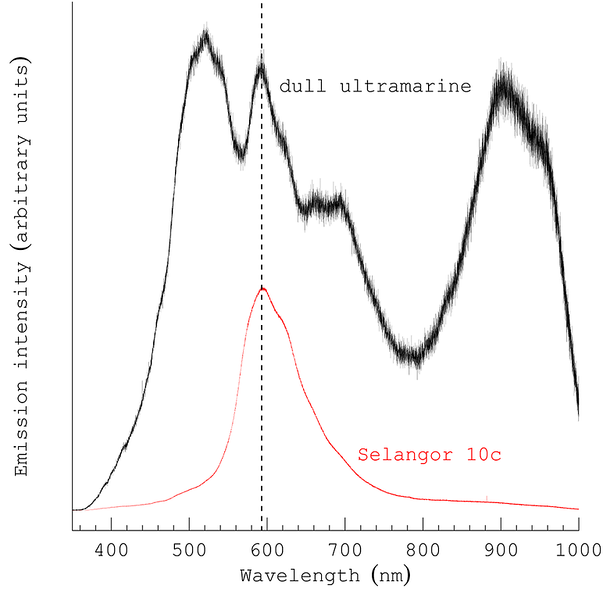 The vertical jump in the ultramarine reference spectrum at 1700 cm−1 is an artifact caused by the combined plotting of separate spectra; Raman intensities of this spectrum below and above 1700 cm−1 should not be directly compared. The two large empirical peaks around 1350 cm−1 and 1600 cm−1 appear to coincide with those of ultramarine, but they are slightly out of alignment and too high to be explained by ultramarine alone. Furthermore, the peak at around 1600 cm−1 may actually be two separate peaks. These large peaks could be signals from something else. Carbon has peaks that come close to matching but they don’t align properly. The smaller peak in the carbon reference spectrum has broad shoulders not seen in the corresponding peak in the empirical spectrum. Additional peaks from unknown substances occur around 900 cm−1 and 1175 cm−1. 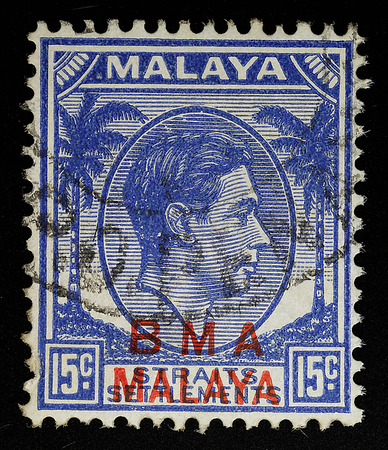 An elusive 'dull cobalt blue' variety printed by Harrison & Son (Cockburn 2015), shown here unoverprinted, has been reported (Malaya Study Group 1993). Many philatelists regard this as no more than a fading of the normal 15c. Faded ink, however, is usually accompanied by other signs like oxidation or degradation of the paper. 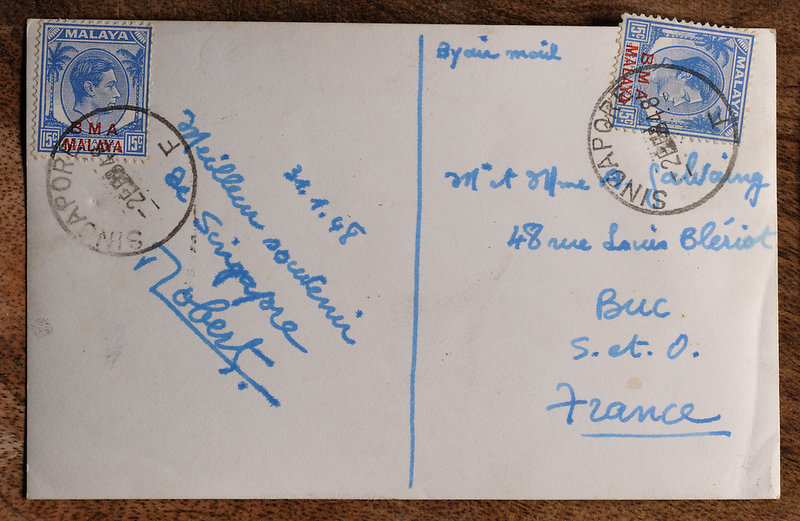 In this example and another in the possession of the author, the paper looks relatively fresh and the watermark is clearly discernible on the reverse. The dull ultramarine on substitute paper is an oddity with a pronounced reddish cast to the naked eye. 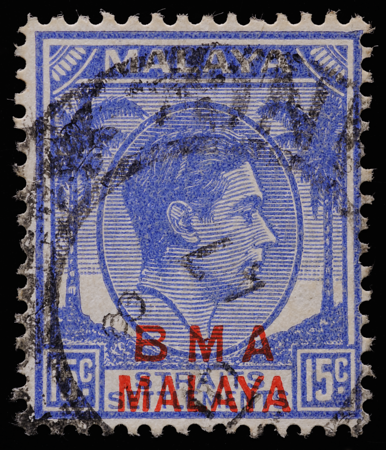 The blotchy impression on the right may be a 'dry print' caused by low temperature or bad mixing of the ink, and/or some physicochemical interaction between the ink and the coating on the substitute paper. The fluorescence spectrum of this shade under 325 nm UV excitation has a peak at about 590 nm which is not found in any of the other 15 cents shades (Lin & Magis 2018). 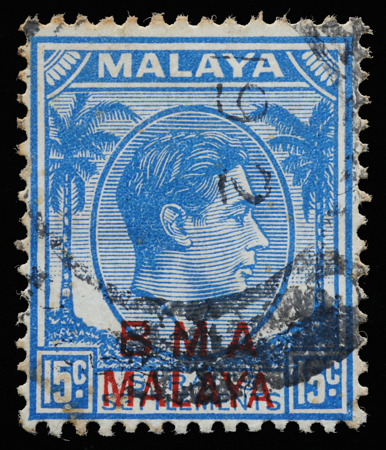 The peak corresponds closely to that in the spectrum (not shown) of a Selangor 10 cents. 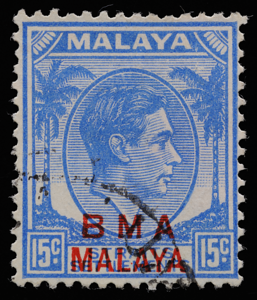 As a magenta ink very similar to that on the Selangor stamp was used for some of the BMA 10 cents, the ink for the 15 cents could have been inadvertently tainted by residue from an earlier batch of magenta ink mixed in the same vessel. I doubt this was intentional. Bright ultramarine on substitute paper. 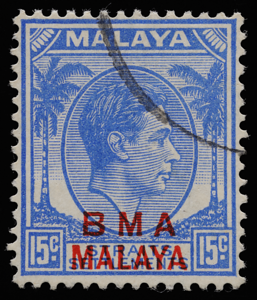 This is possibly the 'blacking of red overprint' forgery reported by Cameron (1950); see forged BMA overprints for details. Deep ultramarine on substitute paper (Lin & Magis 2018). 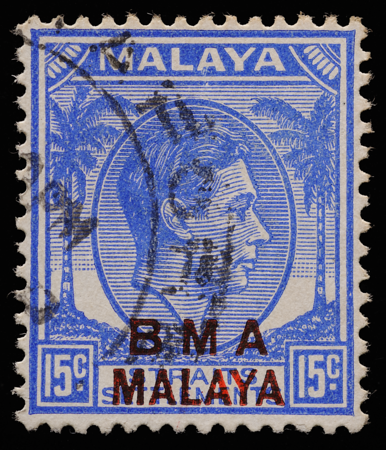 Blue on substitute paper, famously known as the Steel Blue. The blues lack the reddish cast of the ultramarines. Blue on chalky paper. 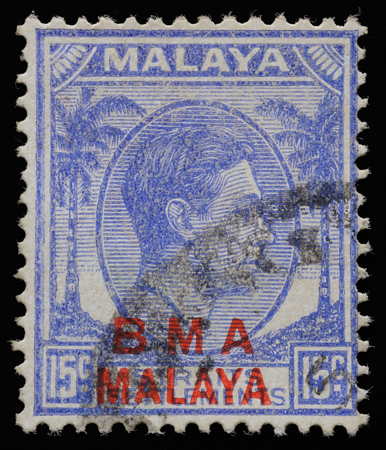 Printed from Plate 2, which has the 'MALAYA' at the top engraved more closely than usual to the top of the frame (author's observation). The stamp on the right has probably experienced significant environmental exposure. Astonishingly, these two look more different from each other than some of the other printings do from one another, yet both have the essential tonal characteristics that identify them as blue on chalky. This pair of changelings demonstrates the variability that can occur across stamps of the same printing. 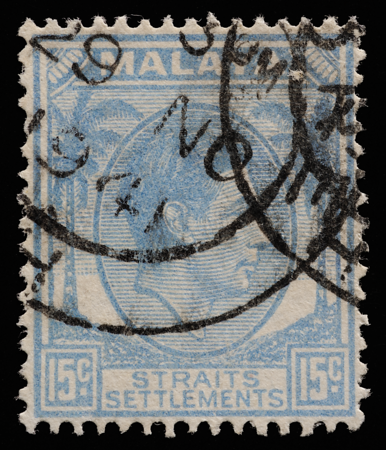 A rare self-made postcard with a view of Singapore's General Post Office from Clifford Pier, affixed with blues on chalky paper with blue handwriting. The G.P.O. was not only the bastion of the coconut definitives, but also the point from which all road distances in Singapore were measured. 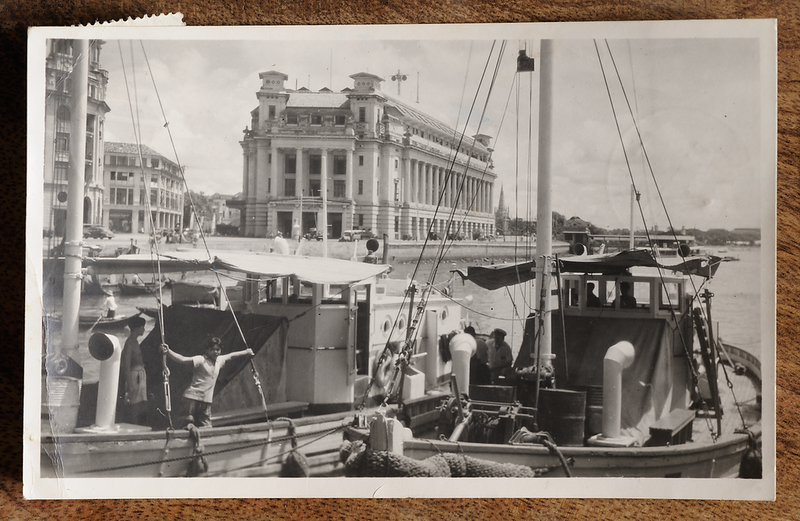 In the background on the right is the Post Office Pier along Collyer Quay, linked to the G.P.O. by a tunnel 35 metres long. Mail arrived from Britain by sea every Friday (Bala Subramanion comm.). I am grateful to Richard Hale and Axel Magis for making their material available for study and for comments that improved the article. Thanks also go to Lim Kim Yong and Sow Chorng Haur at the Department of Physics, National University of Singapore.